The Legacy Collection features a series of suites that embody luxury. Each suite appointed with an old world arts & crafts style. The Evergreen Cottage has four separate and well-appointed units that can be sold separately or as a whole unit to accommodate parties up to 24. The Cedar and Sycamore Cottages are perfect for families or groups seeking to stay in a communal setting. Both cottages are perched on the edge of the gentle-flowing Delaware River. Guests will be provided stunning views and serene panoramas at this riverside cottage. 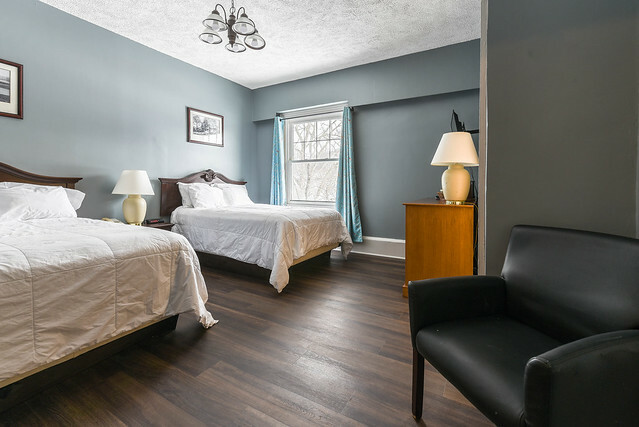 These luxury Poconos cottages and suites include a mini-fridge, alarm clock, and air conditioning and heating for a comfortable ambiance year-round. Turn down service is also available in each cottage and suite. Keep your clothes crisp and wrinkle-free with the iron and ironing board. A hairdryer is also included. Television with DirecTV® videos-on-demand by MovieBeam™ is also available. Guests staying in the Legacy Collection also have access to the many amenities in the Main Inn. Keep up-to-date with email or business in the business center, and don’t leave your workout routine back home when you visit the fitness center. Enjoy a swim in the indoor pool and visit the Shawnee Spa for a relaxing day of pampering. Bell service, valet service, and concierge are also available.